Dr. Quratul Ain (center), Professor Arsalan Ahmad (second from right), and Professor Hideki Mochizuki (third from right) at one of the WCN 2017 events they attended. The XXIII World Congress of Neurology 2017 took place Sept. 16-21 in Kyoto, Japan. 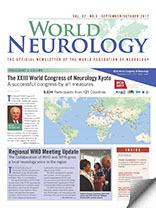 It was organized by the World Federation of Neurology (WFN) and co-hosted by the Japanese Society of Neurology (JSN) and Asian and Oceanian Association of Neurology (AOAN). More than 8,600 delegates attended this conference from 121 countries. As a medical student and an intern, I have presented papers and posters in local and national neurology conferences in Pakistan over the last three years. When my teacher and mentor, Professor Arsalan Ahmad, asked me to submit our abstract to the WCN in Kyoto, I asked him who would sponsor it. “Apply for a bursary” was his immediate response. I was overjoyed when my abstract was accepted for a poster presentation and I was awarded a travel bursary of $1,000 with free registration. Preparing the poster and traveling to Japan was a long journey from Pakistan, yet an amazing one to write about. The International Conference Center Kyoto is a striking architectural beauty with breath-taking scenery and lakes surrounded by green mountains. The main hall offers an amazing interior and a huge seating capacity; the smaller halls are equally as beautiful. The scientific sessions, teaching courses, plenary lectures, and the hall filled with research posters and enthusiastic presenters each day was very interesting. The Japanese cultural flavor and politeness displayed throughout the conference was impressive. Professor Edvard I. Moser, the Norwegian Nobel laureate, presented a lecture during the Presidential Symposium that was both exciting and inspiring. A session on the Zika virus with graphic visuals by Professor Andre Pessoa of Brazil also was interesting. Despite an unexpected typhoon threat, the Opening Ceremony on Sept. 17, in the presence of the prince and princess of Japan, was superb. The reception dinner featured a dramatic Taiko drum performance. The thundering Taiko beats in the air were mesmerizing. It filled the exhibition hall with immense energy. I enjoyed my brief visit to Kyoto, a city that is rich in tradition, with its sprawling street markets and ancient temples. During my morning walk on Manjuyacho Street near my hotel, I heard the temple bell at 6 a.m. Following the resonance, I reached an ancient Buddhist temple. It provided a serene aura, and the glimpse of that moment will be remembered. I later learned that the temple bell is also called “bonsho” in Japan. It is used to summon monks for prayer or to demarcate time. The icing on the cake was a dinner hosted by Congress President Professor Hidehiro Mizusawa. I attended the dinner with Prof. Ahmad. It was a majestic traditional event that included a martial arts performance by children and adults as well as a traditional dance performance by Maikos. I had the rare opportunity to talk to a Maiko and learn more about them. This was followed by a sumptuous nine-course meal. Professor Hideki Mochizuki from Osaka University went out of his way to elaborate on the cultural performances and taught me to eat sushi with chopsticks. The hospitality of the Japanese nation, the energy of the conference, and enlightening lectures from renowned neurologists throughout the conference provides an experience and memories that I will cherish for a long, long time.